Former MK will enter the Gilboa Prison to serve two-year sentence after being convicted of aiding jailed terrorists. 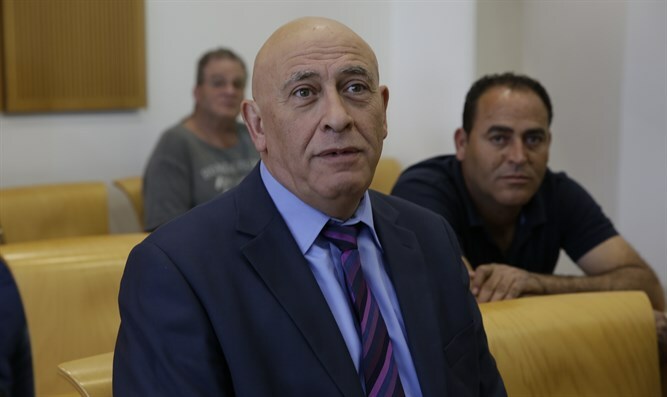 Former MK Basel Ghattas will on Sunday enter the Gilboa Prison, where he will begin to serve his two-year prison sentence. In April, an Israeli court sentenced Ghattas to two years in jail for aiding terrorists imprisoned in Israel. The conviction was part of a plea bargain agreement accepted by Ghattas, who was found late last year to have smuggled cellular devices to terrorists – including convicted murderers – being held in Israeli prisons. As part of the plea bargain agreement, Ghattas resigned from his seat in the Knesset, eliminating the need for a protracted expulsion process from the legislature. In addition to the reduced sentence of 24 months he was fined 120,000 shekels, ($33,300). "Two years in prison in which I take responsibility for my actions for humanitarian reasons. I will come out stronger to contribute to the future that my people aspire to," he added. Ghattas has remained unapologetic over his attempts to smuggle cell phones to jailed terrorists. “Someone who says he acted from his conscience doesn’t apologize. You want me to apologize? The judge asked me to, and I refused. I don’t apologize,” Ghattas said in a recent interview on Channel 2.